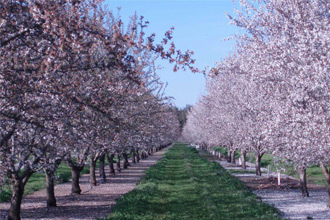 Almonds are the seeds of the stonefruit from the almondtree. The area of cultivation is California (USA), Mediterranean Area and China. Sweet, bitter and shell almonds. Bitter almonds contain poisonous hydrogen cyanide. Due to the industrial process, this kind of stuff is going out of the almonds. Bitter almonds are normaly used for the oil production. Shell almonds get their name from the thin and instable shell. They are relatively unimportant. Our assortment contains sweet almonds from California. These almonds have about 50 % fat, 20 % protein, much calcium and vitamins of the B-Group. Please select on the left side the preferred product group.